These fire extinguisher labels come with bright, bold coloring that is designed to stand out against your décor. Many also come with universally-recognized icons for businesses and institutions that cater to those who don't speak English. Best of all, there are even fire extinguisher signs made on glow-in-the-dark material so the sign remains visible even in the event of a power outage. Also make sure to check out other great items from Buckeye, Tablecraft and Vollrath. plus Vollrath 5618 Traex® Fire Extinguisher Sign - White and Red, 6" x 9"
Our selection of fire extinguisher signs includes a wide range of easy-to-read products. All of our fire extinguisher labels are made to catch someone's eye with their clear typeface and strong coloring, all of which are perfect for use on walls. 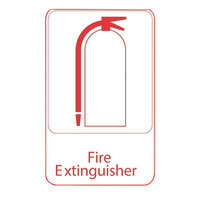 We even carry a specialized fire extinguisher label that can wrap around a pole for added safety. For additional products to go with your fire extinguisher sign, check out our restaurant compliance signs, fire extinguisher cabinets, and fire extinguishers. If you're wondering where to buy vollrath fire extinguisher labels and fire extinguisher signs, we have a large selection of vollrath fire extinguisher labels and fire extinguisher signs for sale at the lowest prices.